eat run sail: Hello Sweetie! For the past several days, this cute little Sweet Dumpling squash has been sitting on the table in the salon... sorta getting in the way actually, cause it keeps getting moved from spot to spot, so today The Captain asked me if I was ever going to eat it or if I was just going to admire it... hmmm. I finally decided to give in and eat it... washed and dried it, and then cut it in half and nuked it in the mike. Then I let it cool and chopped up the innards and made a lovely salad with it for my dinner. It was delicious! 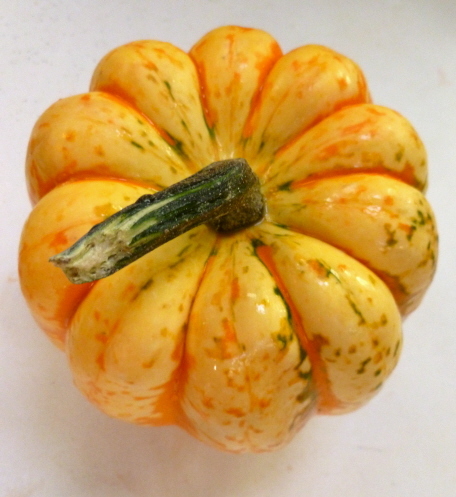 Somewhat like an Acorn squash in color and texture, but defnitely has a hint of sweetness to it. It would be awesome roasted in the oven! 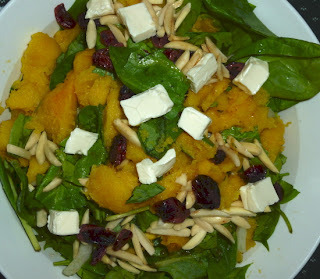 Are you still loving winter squash and pumpkin or are you getting tired of it all? Not me! I am gonna love eating squashes till Spring comes along. YUM! that salad looks so colorful! what is the cheese you used on top (i think that is what it is)? That looks good! I am a squash fan! I love squash, but I NEVER know how to cook them!! That salad looks amazing! Did you just microwave it whole without cutting it up? I have an acorn squash I need to cook soon, but I don't really know what to do with it or what to put it with.